Donald Trump's criticism of a family who's son was killed in Iraq is generating backlash across the nation, and one Bay Area Gold Star mom is getting behind a growing demand for the Republican presidential nominee to apologize. Karen Meredith, of Mountain View, knows the pain the family of Humayun Khan carried on stage at the Democratic National Convention. Her son, 1st Lt. Ken Ballard, was 26 when he was killed in Iraq in 2004. "Capt. Kahn was killed a week after Ken was killed," Meredith said. "We're in the same row at Arlington." 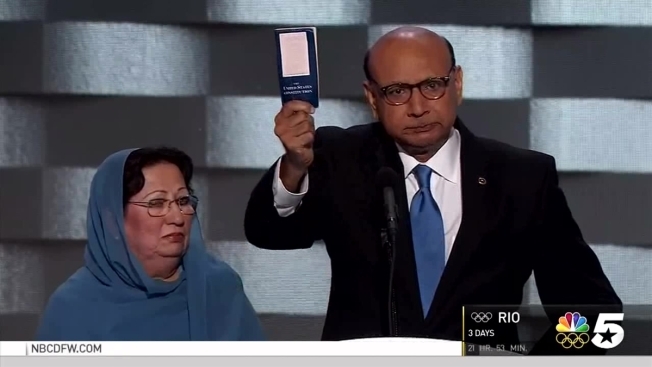 During the convention last week, Khizr Khan took the stage to speak about losing his son. He also criticized Trump's views of Islam. Trump reacted by insinuating Kahn's wife, Ghazala Khan, wasn't allowed to speak at the convention because she is Muslim. Meredith and other Gold Star families are outraged. "We would like an apology," she said. Meredith said she's standing up for families who made the ultimate sacrifice and for the troops who are on the battlefield. She is sending Trump a letter with a growing number of Gold Star family signatures demanding that apology. "I would just ask Trump to consider what it would be like to lose any of his children," Meredith said. "Ken was so proud of being a soldier and so proud of his guys and being a tanker. I know he would never want someone to disrespect that."